VietNamNet Bridge - The accomplishments of the World Reconciliation Day, World Reconciliation Concert, Boston Global Forum and Global Citizenship Education Program with outstanding contributions by Nguyen Anh Tuan are some of the proof. 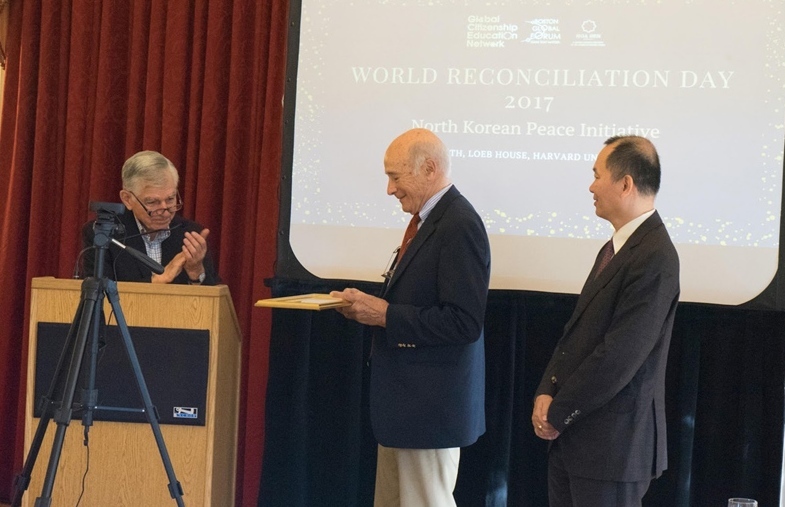 Nguyen Anh Tuan and Prof Michael Dukakis, President of Boston Global Forum, honor Professor Joseph Nye as Excellent Global Educator for Peace and Innovation on World Reconciliation Day, Sep 9, 2017, at Harvard University. I am not a member of the newspaper community, but I’m very interested in the life of Vietnamese press and have special sympathy towards the newspapers and journalists who contribute to the democratization of the society’s life, speak the will of the people and fight against bureaucracy and corruption. One such newspapers and journalists are VietNamNet and its Editor-in-Chief Nguyen Anh Tuan. I remember that in the solemn atmosphere at the Hanoi Opera House on the National Day some years ago, Tuan, on behalf of VietNamNet’s staff, took an oath “VietNamNet vows to always be the filial son of the nation, the honest friend of the people of goodwill in the world." It is a difficult task to be implemented. But VietNamNet has done many useful things, thus gaining the confidence of readers and domestic & foreign public opinion. Nguyen Anh Tuan is a journalist of the Vietnamese press which is on the path towards renovation. Therefore, I felt a bit worried when Tuan left VietNamNet. I was afraid that with Tuan’s departure, Vietnam would lose a good forum. However, my concern was in vain. Overcoming big difficulties, including slander and jealousy, Tuan has integrated very quickly into the new working environment and become an important factor in the environment, the environment of global burning issues, where there are world-famous politicians, social activists and famous scholars from famous knowledge centers. The accomplishments of the World Reconciliation Day, World Reconciliation Concert, Boston Global Forum and Global Citizenship Education Program with outstanding contributions by Nguyen Anh Tuan are some of the proof. With these activities, he has been acting as a bridge, conveying Vietnamese values to the international elite world and bringing their rich knowledge and experience to Vietnam, first to the country’s leaders. Many brilliant minds have soon realized the true purpose of the programs initiated by Tuan and his outstanding qualities – foresight, creative ideas and pioneering. He is able to inspire and organize work, and has generosity and an open heart. Therefore, they have been persuaded, supported and engaged in the ideas he promotes. They respect and highly appreciate the role of Tuan, a younger man with a lower level of qualifications. It is not easy to gain confidence of presidents, prime ministers and ministers, former and incumbent, well-known political and social activists, especially profound scholars from famous think tanks, such as Prof Michael Dukakis, former Governor of Massachusetts, Democratic presidential candidate, Prof Thomas Patterson, whose insights are complemented by rich life experience, including the experience of a soldier on the Vietnam battlefield, or Prof John Quelch, renowned for his knowledge in the field of international commerce. They have deep knowledge in their fields and broad knowledge in many areas, They also have opportunities to access the latest information. So they have scientific spirit, clear political views and only say what they believe. I am really surprised that they have the same opinions about Tuan, which is rarely seen in American scholars well known for their independence. Prof Quelch said Tuan is a person with many creative pioneering ideas. He has been convinced by Tuan that Vietnam can absolutely become a mediator which helps reconcile conflicts and tensions in the world including ones between the US and North Korea, the US and Iran and some Islamic countries in the Middle East, and between the US and Russia. Prof Thomas Patterson commented that Tuan is a person with innate creativity. During the years of working for Vietnet, VASC, VietNamNet and then at Harvard, he has always been inspiring his co-workers to creative ideas, such as the G7 summit anti-cyberterrorism initiative. Tuan led the way to build Boston Global Forum, Michael Dukakis Institute for Leadership and Innovation and Global Citizenship Education Network. Michael Dukakis commented that Tuan is a Vietnamese man who has created noble humanitarian values for the world. Tuan is always full of enthusiasm, full of creative ideas, and always knows how to turn ideas into reality. Professor John Savage from Brown University said Tuan is particularly concerned about peace, security and humanity, love and online ethics which can be seen in the Ethics Code of Conduct for Cyber Peace and Security. I agree with Llewellyn King, the journalist and host of White House Chronicle, that from Tuan’s success, Vietnamese will be confident to contribute values to the world, establish a new mind for each Vietnamese and for Vietnam the country. "Tuan is a person of creative ideas who can be counted on to come up with proposals that are both pioneering and actionable. What’s more, Tuan has convinced me that Vietnam can completely become a mediator country with the ability to resolve conflicts in the world such as US - North Korea tensions, US - Iran relations, conflicts in some Muslim countries in the Middle East, and issues between the United States and Russia." "Having observed Tuan through his process of establishing Vietnet, VASC, VietNamNet, and especially through my years of working with him at Harvard University, I realize he is an innate creator. Tuan is always inspirational and has built support for innovative ideas such as the G7 Summit Initiative aimed at fostering Cyber Peace and Security worldwide. He led the way to founding the Boston Global Forum think tank, the Michael Dukakis Institute for Leadership and Innovation, and the Global Citizen Education Network." "Tuan, a native of Vietnam, has created noble humanitarian values for the world. I always see him full of enthusiasm, full of creative ideas, and he always know how to turn such unique ideas into reality." "In addition to putting endless effort into creating and implementing several peace initiatives, Nguyen Anh Tuan has demonstrated his particular concern over harnessing the Internet as a means of fostering peace, security and humanity— most especially through his creation of the Ethics Code of Conduct for Cyber Peace and Security." Llewellyn King, Producer and Host of "White House Chronicle"
"Through the many successes of Tuan, the Vietnamese people have gained the confidence needed to contribute positive values to the world, and establish a new leadership mind-set for every Vietnamese and the country as a whole."